Location: Jouillat, in the Creuse departement of France (Limousin Region). 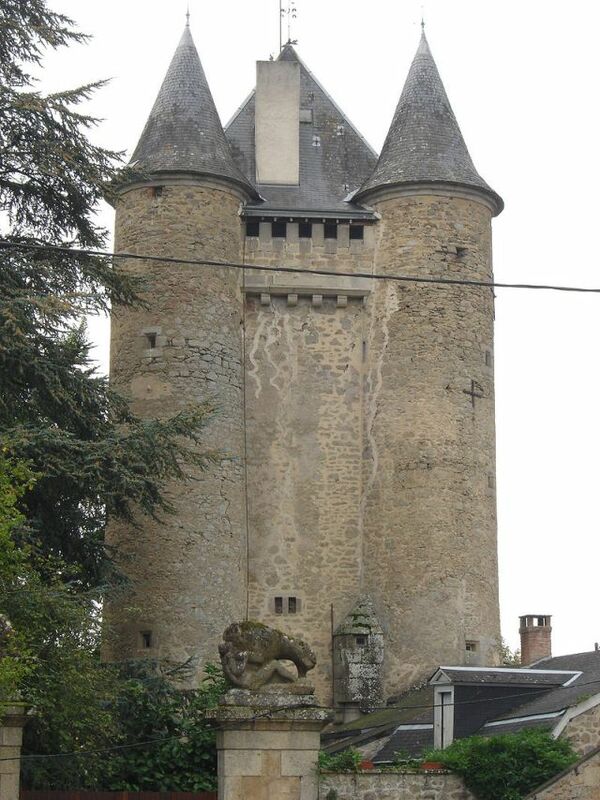 Notes: Château de Jouillat is located in Jouillat in the department of Creuse and Aquitaine-Limousin-Poitou-Charentes region. The castle is listed in the inventory of historical monuments since June 15, 1926.Castle Jouillat date of the fourteenth century. It was originally a simple tower defense military, not a stately home, as evidenced by its inverted staircase screws. This tower would have been intended to protect two castles. The tower then experienced a period of abandonment in which many stones were removed by farmers to build their homes. Chimneys then disappeared. He was rehabilitated in dwelling in the nineteenth century. The trays constituting the three levels were then divided to create living rooms and chimneys were rebuilt anachronistically, nineteenth way. Since the late nineteenth century, its portal batteries are topped with two statues representing each a lion eating a man. These sculptures come from the castle Bretouilly also located on the town.The castle is now private and is not open except during Heritage Days.